Solar hot water systems are a great way to take advantage of Australia’s sunshine to heat up your water system. Based around other solar systems, in which the sun’s energy is absorbed through solar collectors (which are either flat panels or evacuate tube that are placed on the roof), the energy is then transported to an insulated tank that heats up the water. On days when it is cloudy and a lack of strong sunlight, you might need a booster that increases the heat of the water, once it falls below a thermostat setting that you set yourself. But that is merely a minor addition. Solar hot water systems generally cost more to buy and install, but the savings come from lower energy bills. Furthermore, they are environmentally friendly. At Endeavour Plumbing, we can help you get started by installing an environmentally friendly solar hot water system. Our offer of conducting regular inspections means that your system will always be running 100% effectively. Furthermore, our extensive expertise in the plumbing industry guarantees that if you are facing any solar hot water problems, we can take care of it. We have the right tools and experience to ensure that the job gets done at an affordable and competitive rate. So for all your solar hot water system needs and wants, contact Endeavour Plumbing. We are available 24 hours a day, 7 days a week. To get in touch with us, you can all either Ben on 0403 531 071 or Rob on 0411 615 815. 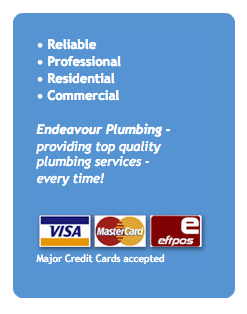 Or feel free to email us on endeavourplumbing@bigpond.com or fill out our free online quote form on our Contact Us page.